Try as you might, it is almost impossible not to find Sherlock Holmes explosively entertaining. First of all, a disclaimer: Ignore the title of this film. It bears little resemblance to Sir Arthur Conan Doyle’s famous works, nor does it do them any justice. But looked at as an independent entity, Guy Ritchie’s second incantation of Sherlock Holmes is a tremendously fun and entertaining action adventure that is bigger and better than the first. More than any other modern filmmaker, Ritchie has the ability to switch from slapstick silly to adrenaline pumping special effects action in a heartbeat, and in the Sherlock Holmes universe he’s created, he wilfully skips back and forth between the two with fantastically fun results. Game of Shadows is a direct sequel to Ritchie’s first Holmes instalment, and while it assumes you have seen that film, it is certainly not required viewing to be able to appreciate the latest offering. Diving straight back into the plot as Professor Moriarty (Jared Harris) and Holmes (Robert Downey Jr) square off across Europe in an effort to prevent war between Germany and France, this is true edge of your seat stuff, full of explosions, chases and slow motion fight scenes (though the latter is unfortunately overused). 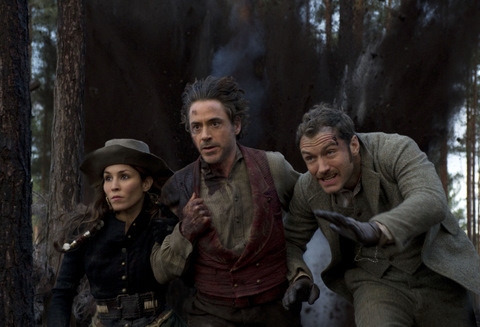 The special effects silliness of Ritchie’s film is masterfully inhabited by Downey Jr and Jude Law, who continue their partnership as Holmes and Watson to wonderful effect. Within the first act of the film however, a shining beacon appears in the form of Harris as Moriarty, and all of the best scenes in the film are when he and Downey Jr are pitching against each other onscreen in a battle of wit and cunning. There is a sense of calm and concentration as the pair are simply indulging the audience in an acting master class, and it serves as a very welcome relief from the overblown nature of some of the other scenes. The torture scene especially is one of the more convincing sociopath displays that you will ever see on screen. Stephen Fry acts also as an element of more traditional comic relief as Holmes’ older brother Mycroft, although at times he feels a little underused. Some of his scenes contain more gratuitous gags that don’t really do Fry’s brand of intelligent and subtle humour justice. In the end, it comes down to a fairly simple summary: If you liked the first film, you will love A Game of Shadows. If you didn’t, you won’t. In fact, the main issue really is that the latest film just doesn’t feel like it is doing anything that different, or that it’s in any way moved on from the first film. Still, the detective story at its heart is strong, and once the comedy elements have found a more even pace towards the latter part of the film, it’s eventually very funny. It’s a movie you almost want to hate simply because of the sheer creative licence it takes to some of the greatest crime fiction literature ever produced. But try as you might, it is almost impossible not to find Sherlock Holmes explosively entertaining.